Background to the dilemma involving Actonel research in Sheffield is here, here and here. The research involved a secondary endpoint in randomized trials used to demonstrate the efficacy of risedronate (Actonel) for regulatory approval. The company violated the norms of science under whose banner they claim to sell their products. A pharmaceutical benefactor (Proctor & Gamble) repeatedly refused to provide raw data including randomization codes to academic "collaborators". Data was required by the academics to verify scientific reports, statistical analyses, meeting abstracts (1,2), and draft publications "ghost written" in their names. Data was provided to authors 3 years later, in early 2006, following press exposure. "Fair" analysis of the data would not have yielded findings desired by the sponsor. The writer is Professor Richard Eastell, collaborator in this research, and then Research Dean of Sheffield Medical School. It was written after numerous attempts to gain access to data from the company, and after some information had emerged to suggest that the analysis performed by P&G was implausible. A publication based on overlapping data had already appeared in press (Eastell et al., 2003 J. Bone. Miner. Res. 18:1051-6) - the raw data underlying this overlapping paper had also not been disclosed to Sheffield authors (BBC broadcast). Click here for PDF version of letter or on images above to enlarge. Dreadful, condescending balderdash. This contravenes ICJME guidelines and every dictum of authorship. 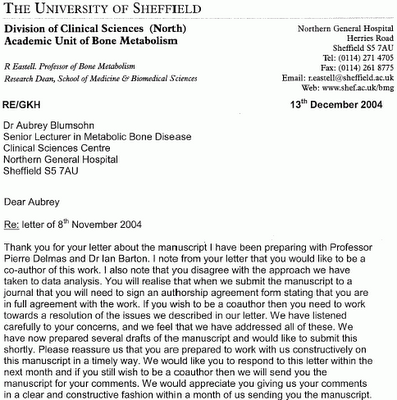 From what Eastell says, all publications in the field of osteoporosis should immediately be examined. Thank god I'm retired. [technical note: You have one acrobat correspondence missing (the one from Eastell is duplicated)]. I'm outraged and I am paying attention. What was P&G thinking! The guidelines from PhRMA say that there is not access to the data (other than those from your centre)for investigators? Is there a reference for you to look this up? Of course PhRMA "guidelines" don't say that (for what "guidelines" from this discredited lobby group are worth anyway). This is a complete red herring - eveyone accepts that an individual scientist in an individual center who recruits 5 patients of 5000 in a large multicentre RCT might not have access to the entire study database (but even that should be debated). It has nothing whatever to do with the rights and obligations of a scientific author or principal investigator! I have always held Richard Eastell in the highest regard, but this looks bad to me. I'm very sorry. 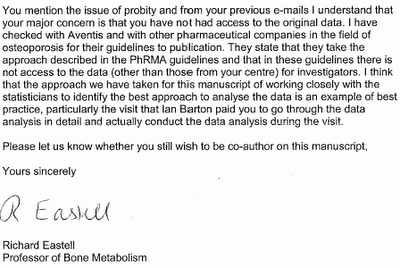 How long did it take Eastell to master the art of writing such putrid nonsense? And why have you stopped blogging? Have you seen this old story?